Like many that we've reviewed before, this is a sauce by a competition barbecue team - and one of the best. Smoky Mountain Smokers, from Sevierville, Tennessee, have come on strong in the last few years, culminating in a 5th place finish in the overall KCBS standings in 2008. We often compete against them at contests here in Middle Tennessee, and to say the least, they are a worthy adversary. And wow, do they make one heck of a sauce! It definitely has shades of Blues Hog, with its heavy sweetness and savory essence of tamarind. But it's definitely its own sauce. It's not quite as thick as BH, and there are subtle but significant differences in flavor. 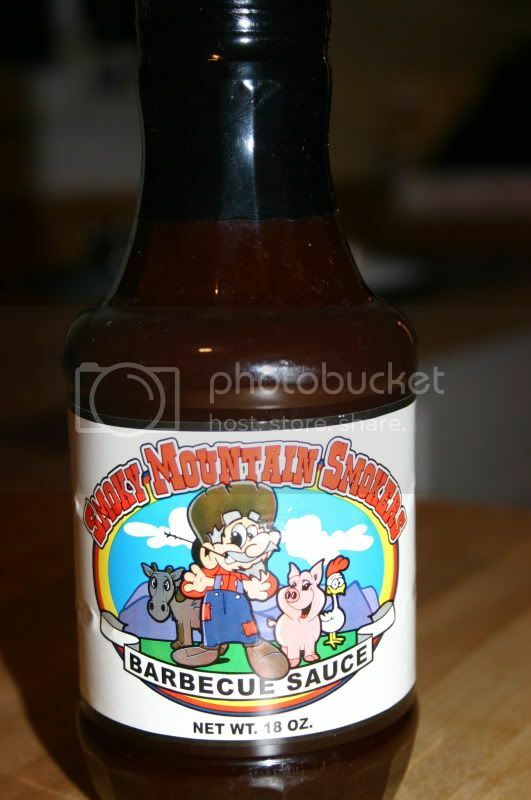 SMS' sauce has molasses higher in the mix, as well as prevalent notes of mustard, garlic and cumin. The pronounced cumin flavor plays especially well with the sweetness of the sauce. The sauce leaves behind a nice mild lingering burn that is also a nice complement to the sweetness. Overall, an excellent, very tasty sauce! This weeks music selection comes to you via Lynchburg, TN. The site of this weekends Jack Daniels BBQ Contest and the home of famed musician Little Richard. I know, I know...more like Friday Night Slackers. 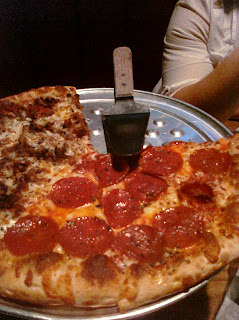 This week's pizza review takes us a little north of our normal sphere of pizza influence: Louisville, Kentucky. Louisville is home to the famous Kentucky Derby, the Louisville Slugger baseball bat factory, the Bluegrass Balloon Festival, the world's largest Beatles festival, the original Lebowski fest, the former recipient of my paychecks: ear X-tacy, and the questionably safe Six Flags Kentucky Kingdom. Louisville offers a wealth of local restaurants across every ethnicity and style. The streets are lined with unique bars, restaurants, bakeries, delis, and bistros in lieu of Logan's, Applebee's, Ruby Tuesday's and Chili's. And while Louisville also houses the world headquarters of Papa John's and Pizza Hut, there are an incredible number of local pizza parlors. After asking around and consulting Where The Locals Eat and the local alt-weekly, we decided to go with the 2009 people's choice winner. 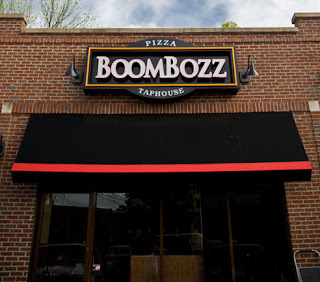 In 1989, Tony Palombino opened Boom Bozz Pizza in Louisville. What began as a modest little parlor has evolved into a dominant force in the city with four packed locations where various local and international awards line the walls. Boom Bozz, of course, does it all from scratch with a very thin and tangy tomato sauce base coated in 100% mozzarella cheese. The dense cheese has little pull away and gets a bit greasy, but boy is it tasty. The pepperoni surprises with its flavor and spice, building upon itself with a little heat as well. The crust is a little disappointing for a place that has everyone falling at its feet - it's a basic hand-tossed crust that's cooked well but has little to no flavor. While I do it pepperoni-and-cheese-only-style for these reviews, it's clear that Boom Bozz brushes its shoulders off with its specialty pizzas. The D'Sienna (International Gourmet Pizza Winner) has a tomato cream sauce, mozzarella, asiago and romano cheeses along with fresh chopped spinach. The Pollotate (2008 International Pizza of the Year) has marinated grilled chicken with roasted potatoes and onions on a garlic olive oil crust with asiago and mozzarella. Boom Bozz offers starters (the fried ravioli is excellent), salads and sandwiches as well along with over 30 microbrews (the Magic hat has more than just a hint of apricot) from its new "Ice Bar" at the Bardstown Road location. For the exotic specialty pizzas, I'll give it to you Boom Bozz...but c'mon Louisville, the hand-tossed pepperoni pizza just barely snuck above average. While my pizza reporting will continue to be sporadic throughout the remainder of the year, the quest for the best pizza isn't dead! Got any suggestions for places that I should cover? Let me know! At first glance, Dinosaur Jr could probably be lumped in with the Nirvanas, Mudhoneys, and Soundgardens of the grunge movement, but in many ways they were actually the antithesis of that genre, with their sprawling arrangements, drawling vocals, and lengthy guitar solos. Bandleader J Mascis is kind of like the Neil Young of Generation X, only without the commercial success - an introverted guitar anti-hero with a shaky voice and a deep catalog. The cool kids will tell you that the best Dinosaur Jr albums were You're Living All Over Me and Bug, from their days as indie darlings, and back when it was truly a band and not a thinly veiled Mascis solo project. But I think they did their best work later, in the early 90s, when they sold out and signed to Sire. Green Mind and Where You Been were the soundtrack of my early teenage years, and still hold up pretty well today. Check out this extremely raw 1994 performance on British television programme The Word. Dinosaur Bar-B-Que is a well-known barbecue restaurant that originated in the 1980s in Syracuse, New York as a small biker bar, but has now grown into a full-blown enterprise, with additional locations in Rochester and New York City. And they have reached that lucrative level of notoriety which brings with it...airmail revenue. Yes, like so many of the institutions in Memphis, you can have a rack of Dinosaur ribs packed on dry ice and shipped to you overnight. So needless to say, they have their own brand of barbecue sauce. It's a relatively thin sauce, vinegar and tomato based. It has lots of little pieces of garlic, onion, and green pepper floating around in it, giving it a chunky mouthfeel. Overall, the sauce has a very fresh, earthy taste, with the natural sweetness of the tomatoes and the tanginess of the vinegar leading the way, flanked by mustard and fresh onion and garlic flavors. It's a pretty mild sauce in terms of the heat level. Without really planning to, I wound up at a barbecue restaurant in Jacksonville over the weekend. After watching the Titans get completely dismantled by the Jags, we headed for the airport and were looking for a quick bite before we returned the rental car. We wound up at Sticky Fingers. And I have to say - for a chain barbecue restaurant, they turn out a pretty good rack of ribs. I brought some sauce home to review. The "Memphis Original" sauce actually reminds me more of Kansas City than Memphis. Although less thick than a KC-style sauce, it has the smokiness and the molasses sweetness that tend to overshadow the tomato element. Worcestershire and vinegar flavors are prominently featured too, as well as a light peppery finish. Overall, a pretty average, unspectacular sauce. Former KCBS president Tony Stone sits down with BBQTV for a one on one interview. Tony has been around bbq for a long time and he has some real interesting things to say about KCBS and bbq in general.